Unmistakable. 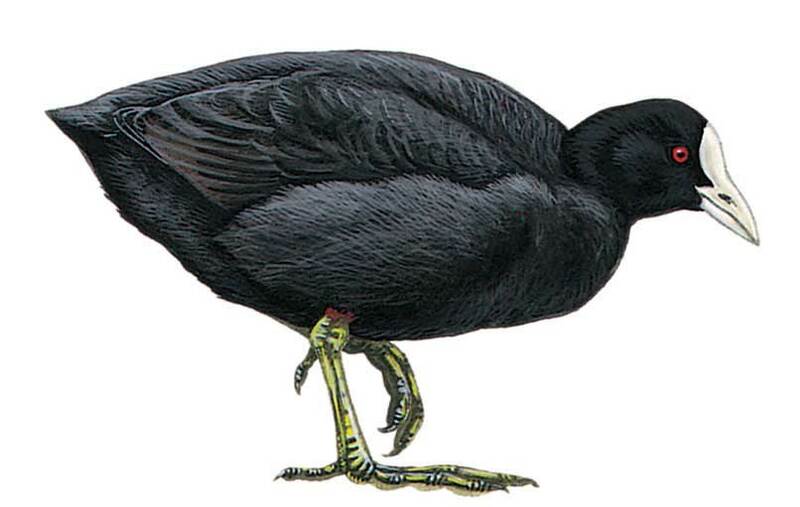 Sooty black with white bill and frontal shield; hunchbacked appearance on water. Upright stance on long green-grey legs and long lobed feet when out of water. Flight is stronger and heavier than other rails, more duck-like, on rounded wings and with long pattering run across water before take-off. Note long toes trail behind tail-tip. Juvenile duller and paler with nearly white underparts and smaller frontal shield. Dives well, but only for a short time. Markedly gregarious especially in winter concentrations.